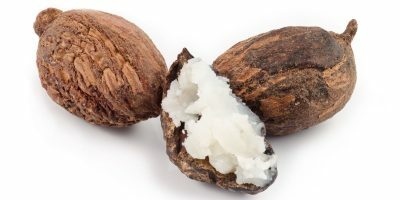 Babassu oil is basically soft, light coloured, butter. It melts in 30 degrees and then becomes on oil. It can successfully be used both in solid and liquid form. Why should it appear in your bathroom? First of all, it is perfect as a hair conditioner. It can be added to your regular conditioner. Thanks to this, your hair will become soft and strong, and what is also important, easier to comb. Secondly, it protects the hair ends. You can apply it on damp hair tips after each washing. This will replace using a serum for dry hair ends. It will protect the hair from harmful factors (such as strong brushing, straightening, hot air from blow-dryers, strong rubbing with a towel). Thirdly, it can be used for oiling your hair. Prior to the application, the oil should be heated up and then rubbed on the scalp and hair. It is advisable to leave the oil for about two or three hours on your hair (preferably throughout the night). Tie your hair on the top of your head and cover with a towel because the substances contained in the oil, like hot environment. Thanks to the heat, it will work better, whereas the towel will also prevent stains on your pillow. Additionally, babassu oil can be mixed with other oils with the same properties. Due to the fact that the oil penetrates the hair deeply, it can be used with shea butter, palm oil, cocoa butter, coconut oil or castor oil. Combining all these oils will strengthen their effects and bring tremendous visual effects instantly. What is more, babassu oil will be extremely useful when going to the beach. It is very important not to forget to apply this oil prior to sun exposure, due to its sunscreen content. It will prevent your hair from the harmful UV radiation. Last but not least, babassu oil can be a huge help to determine the hair porosity. In order to do that, you must apply the oil to your hair and leave it for about an hour or two. The best idea will be to let your hair air-dry. If your hair appears to be dry and frizzy after that, this means that it belongs to the high or medium porosity group of hair. Keep in mind that this oil, as well as coconut oil, are not recommend for such hair types. Babassu oil is perfect for low porosity hair. Such hair is easy to weight down which is why it likes all oils and butters that belong to the penetrating group of oils. They do not leave a heavy layer on the hair or scalp because their tiny molecules are quickly absorbed. The cuticles of low porosity hair are bonded closely together which prevents bigger molecules from entering inside. It means that those stay on the surface and weight the hair down. Low porosity hair will be fond of all oils and butter with small molecules that are easily absorbed. Babassu oil is definitely one of them!